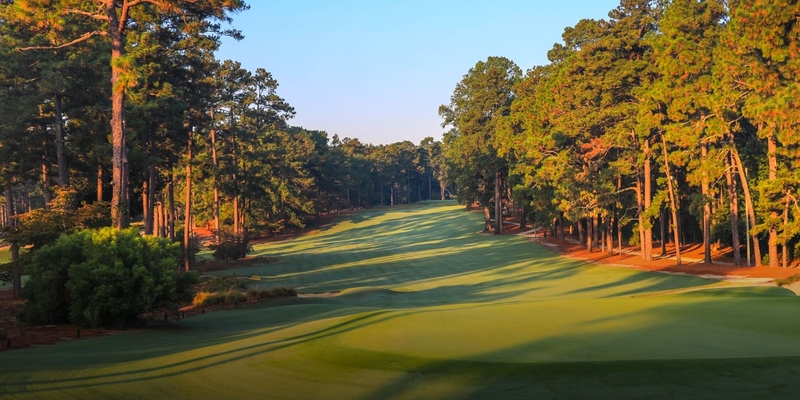 The Sandhills area of North Carolina, in the 1920's, was a bustling resort enclave with golfers from the Atlantic Seaboard and points beyond visiting to enjoy its Donald Ross-designed courses and soothing way of life. Ross, a native of Dornoch, Scotland, came to America in 1899 to forge a career in golf - a game in its infancy in a new land. Throughout his career, Ross would design nearly 400 golf courses and become one of the preeminent course architects in the history of the game. Two of his finest pieces of work were erected just four miles from Pinehurst, down Midland Road in Southern Pines. Mid Pines Inn & Golf Club opened in 1921, and Pine Needles Lodge & Golf Club followed in 1928. Please call 910-692-2114 for current rates. Call 910-692-2114 for rates and tee times. Contact Mid Pines Inn & Golf Club at 910-692-2114 for more information and details on holding a golf outing at the course. Contact Mid Pines Inn & Golf Club at 910-692-2114. Contact Mid Pines Inn & Golf Club at 910-692-2114 for onsite or nearby dining options. This profile was last updated on 01/13/2016 and has been viewed 8,310 times.